In this example we're going to create a car purchase order and take a log of it. It consists of 1 Producer & 1 Exchange & 1 Queue & N Worker & 1 Consumer. Example relies on RabbitMqBundle. 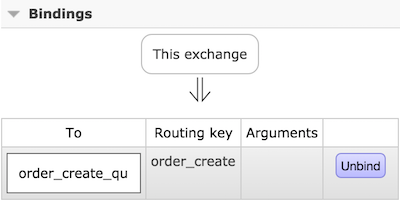 In the image below, RK stands for "routing_key" and BK stands for "binding_key". Request - User places an order create request. Controller - Request gets validated and passed on to Service. Service - New order gets inserted into database, an order create event is created and the response is returned to user. This is where application process is finished so no more waiting time for user. Event Dispatcher - Picks up the event and dispatches it. Event Listener - Picks up dispatched event and passes it on to Producer. Producer - Creates a message and puts it into "order_create" queue. Consumer - If the worker is running in terminal, it catches the message from "order_create" and processes it. If the worker is not running yet, it would start consuming messages later on when the worker is started. Install "oldsound/rabbitmq-bundle":"1.8.0" with composer and activate it with new OldSound\RabbitMqBundle\OldSoundRabbitMqBundle() in AppKernel.php file. You should normally validate the request and map it into a model class. There are a lot of examples about how it is done in this blog. There is a reason why we just log failed messages and do nothing about them. You can find the post related to the answer in this blog. If the message processing fails for some reason, log would have record below. This is the kind of payload we're going to use for testing purposes when creating new orders. 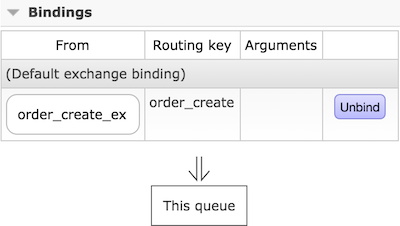 Run a consumer and stop it so that you have the RabbitMQ components (exchange, queue etc.) are ready and bound together otherwise messages will be lost. You should have a visualised diagram below. I created 2 new orders. As you can see above, there are 2 queued messages waiting. I'm now going to run a consumer to show what happens. You might need to close dead connections otherwise messages won't be redelivered. As you can see above, all pending messages have been consumed. I created 5 new orders. As you can see above, all 5 messages have been consumed right away by two consumers in round-robin dispatching way.